It sounds like a recurring nightmare: an armed male intruder breaks into a women's dorm and with a gun and a butcher's knife, binds and gags all the residents. Then one by one, he kills them cruelly and with great brutality. All of that happened in Chicago on the night of July 14, 1966, in a dormitory that housed eight nurses who worked at the South Chicago Community Hospital. 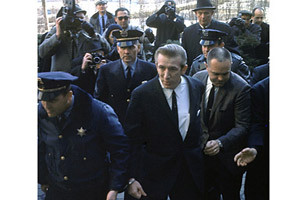 The perpetrator was Richard Speck, then 24, a drifter born in Illinois, raised in Texas, wandering from petty crime to petty crime and bar to bar. At the age of 19, he had the words "Born to Raise Hell" tattooed on his arm. His victims were all eulogized as saints, people who had committed their lives to helping others. He would be positively identified by one of his intended targets, Corazon Amurao, who survived the attack by hiding under a bed. Speck knew there were eight women in the dorm; he did not know that a friend was also staying over that night. So Amurao survived as the guest was led to slaughter. The jury found Speck guilty after a mere 49 minutes of deliberation and he was sentenced to the electric chair. In 1972, however, the U.S. Supreme Court declared the death sentence unconstitutional. Resentenced to hundreds of years in prison, Speck died in 1991. No one claimed his body, which was cremated and the ashes scattered to the wind.